During the conference, attendees were encouraged to share their learnings, insights, and questions. Kay took the opportunity to share about how rewarding it was to have dedicated time and space to tackle their organizational challenge. 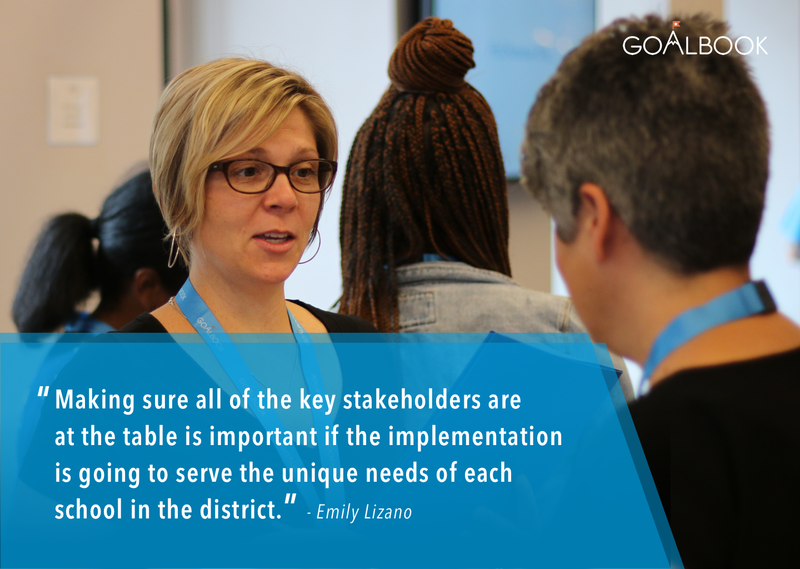 Kay Seale, Special Education Director, and Emily Lizano, SPED Department Head of Team Chairs, from Worcester Public Schools in Massachusetts came to Goalbook’s first annual User Symposium with a specific mission. Their challenge was concerned with the quality of instruction, specifically Tier I interventions that students were receiving prior to being placed in more restrictive settings. Essentially, they concluded that students at Worcester Public Schools were being prematurely pushed into restrictive special education programs without being exposed to best practices that could scaffold their learning enough to prevent them from needing more intense interventions. 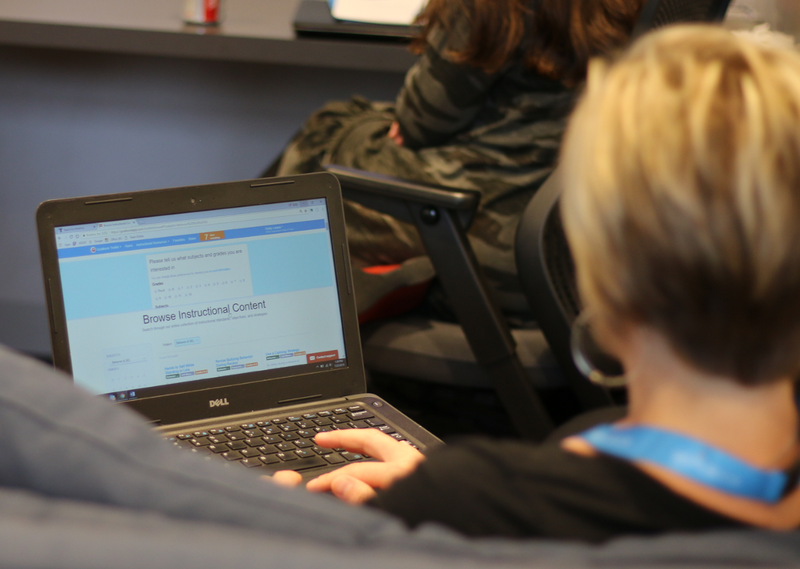 Our User Symposium is an opportunity for school and district teams to convene and learn from each other’s work in supporting teachers to transform instruction through the use of Goalbook’s products and services. All in attendance came with specific instructional and behavioral challenges. After two intense days of workshopping with the Goalbook team, they left with implementation plans geared towards attacking those challenges with research-based best practices and resources. 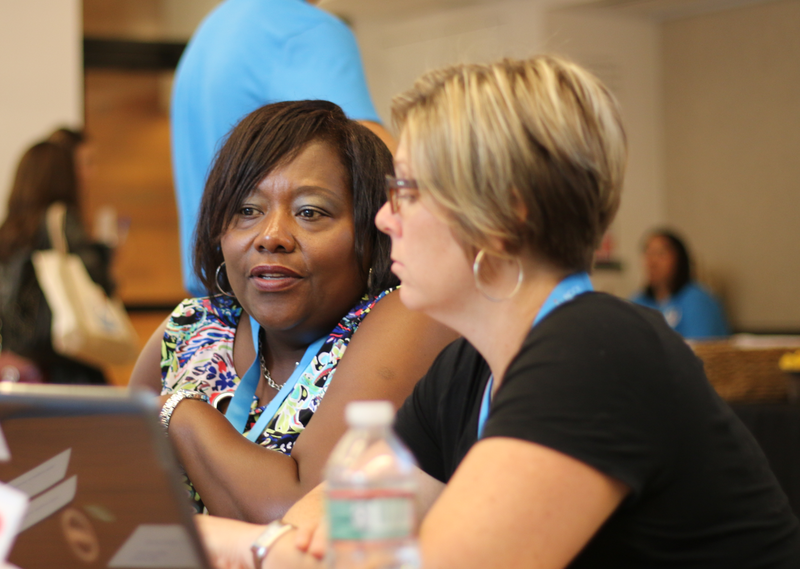 Attendees had the opportunity to collaborate with school and district teams from across the country. One thing that emerged during the collaboration across teams was how critically important all of the stakeholders were in the implementation of any plan. Leadership teams spent a lot of time designing solutions with their teachers in mind. At Worcester Public Schools, the de facto strategy for supporting struggling students had largely become simply handing over responsibility for academics and behavior to the special education department. Kay (left) and Emily (right) spent the lion’s share of their time designing a solution to push them toward achieving their strategic goal. Goalbook User Symposiums are about empowering our users to design solutions that make sense to them. We don’t pretend to be experts on every challenge—we equip our partners to be experts at attacking their own challenges. The fact of the matter is that there are tons of factors that could be contributing to the lack of access to general education for students with special needs. Emily and Kay’s work was focused on coming up with a small, doable, and impactful change that they could implement with their level of influence and responsibilities. The change that they pushed forward on was to increase teacher efficacy through giving them access to research-based behavioral and instructional practices. The plan they ultimately settled on was chiefly concerned with increasing the quality and effectiveness of Tier I instruction before referring students to special education. Every team in attendance was given an in-depth product overview that introduced them to all of the product features. Goalbook facilitators were available to answer any questions as well as give example of how users have already applied product features in various contexts. Build a culture of shared responsibility and collective ownership over student success to eliminate the notion that general education and SPED teachers are operating independently of one another. 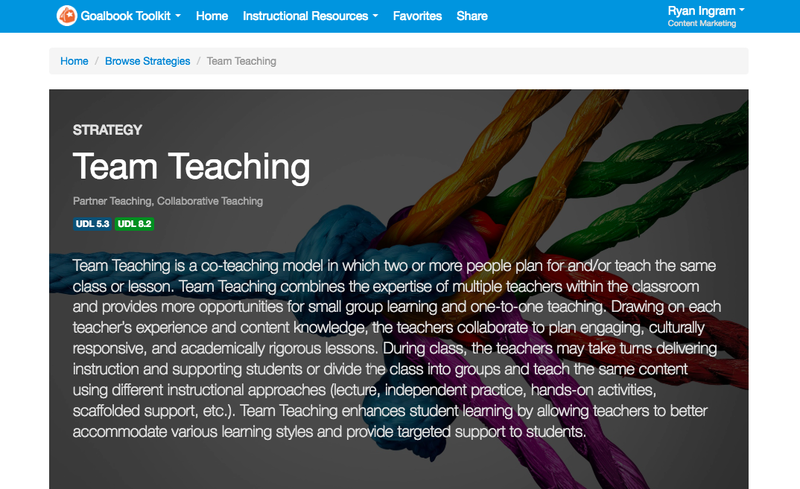 Increase the repertoire of skills and best practices for supporting students with academic or behavioral barriers of all staff involved through the use of Goalbook Toolkit’s strategy pages as well as the embedded best practices in all of Toolkit’s resources. The UDL-aligned strategy index contains over 350 strategies that address instruction and behavior. 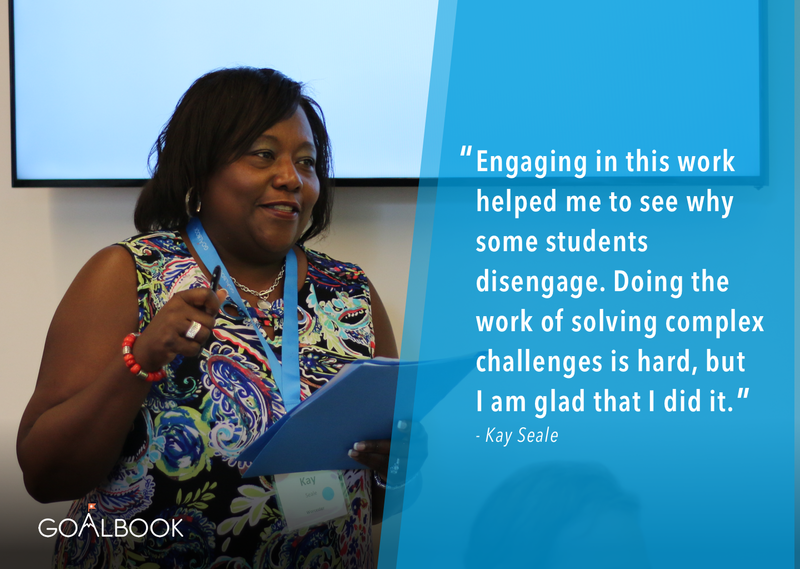 Ultimately, their desire was to tap into what they know their teachers are capable of by using Goalbook Toolkit as a PD tool and instructional design tool. For Emily and Kay, simply giving their teachers special education resources was not enough. In order to realize lasting change, they needed a solution that would impact teachers’ mindsets, knowledge, and ultimately their habits. Learn more about our Instructional Symposiums to see how you can affect lasting change in your district or school!